Augustus Witschief Bennet (October 7, 1897 – June 5, 1983) was an American politician and a United States Representative from New York. Born in New York City, New York County, New York Bennet was a son of U.S. Representative William Stiles Bennet and Gertrude (Witschief) Bennet. He attended the public schools in New York City and Washington, D.C., and graduated from Amherst College in 1918. During the First World War, Bennet served in the United States Naval Reserve Flying Corps with the rating of chief quartermaster from June 8, 1918 to January 19, 1919. He graduated from the Columbia University Law School at New York City in 1921, was admitted to the bar the same year. Bennet commenced practice in Newburgh. He was United States referee in bankruptcy from 1923 to 1944, and was married to Maxine Layne on October 19, 1929. 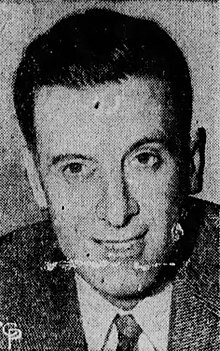 Elected as a Republican to the Seventy-ninth Congress, Bennet was U. S. Representative for the twenty-ninth district of New York and held that office from January 3, 1945 to January 3, 1947. He was an unsuccessful candidate for renomination in 1946. Resuming the practice of law, Bennet resided in Laguna Hills, California until he died in Concord, Massachusetts, on June 5, 1983 (age 85 years, 241 days). He was cremated, and his ashes are interred at Cedar Hills Mausoleum, Newburgh, New York. ^ "Augustus W. Bennet". Find A Grave. Retrieved 26 August 2013. ^ "Augustus W. Bennet". Biographical Directory of the United States Congress. Retrieved 26 August 2013. ^ "Augustus W. Bennet". Govtrack US Congress. Retrieved 26 August 2013. ^ "Augustus W. Bennet". The Political Graveyard. Retrieved 26 August 2013. United States Congress. "Augustus W. Bennet (id: B000367)". Biographical Directory of the United States Congress.